With Homogenic Bjork started to move away from the world of pop and into something else. This something else was immediately patent in Vespertine, an album which really moves away from more conventional popcraft into Bjorkishness. 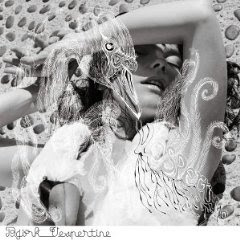 So Vespertine sounds different, but that does not mean that it is not an accessible album (it is not Drawing Restraint 9), in fact it consists mostly of very pretty music, constantly evoking the idea of winter and snow through it's use of loads of "twinkly" sounds, from music boxes to bells. In fact, one of the best songs in the album, Frosti is completely instrumental, again showing her strengths as a composer, which really is her greatest strength. Lyrics are as usual not that fascinating but surreal enough to keep you interested, as a singer she's ok, but as a composer she is really great, and this is something lacking in the music scene of the early 00s. So yeah, go Bjork. The lyrics of "Harm of Will" were written by Harmony Korine and are allegedly about Will Oldham.